It’s Summer time! It’s hot, humid sometimes down right nasty! Super Waterman to the rescue! Yes, my new found friend and client, Leslie Gabriel, owner of WaterCheck.biz is charging into the online scene with his infectious love for all things water! With over 250 of the best H2O products for water lovers everywhere, an H2O radio, WaterBlog, and more this man knows the “elixir of life”! Leslie wants to make sure you can always have clean, fresh water by your side at all times and is giving my readers a chance to win a beautiful Klean Kanteen set! 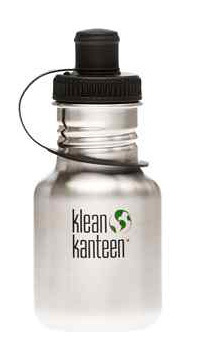 An 18 OZ Klean Kanteen Stainless Steel Water Bottle SS Loop Cap & 12 OZ Klean Kanteen Stainless Steel Water Bottle Sports Cap. Reusable, lightweight and risk free. Comes with a stainless steel loop cap. Its made of electropolished #304 food-grade stainless steel. Slim design fits most bottle holders. Clean tasting (hot or cold). This set will be wonderful for Mom-on-the-run or the kids lunch boxes! Here’s the scoop – this is a Twitter based giveaway, so if you aren’t on Twitter get your account going NOW!! You will greatly improve your chances of winning! Go to Watercheck.biz and find a product you would love to try – Tweet a link to the to the product page, link to the update in a comment. Stumble, Digg, post to Facebook or other Social Networking sites about this giveaway. Register with the Watercheck.biz site for Coupons, Newsletters & Exclusive Deals! You get the idea on this one, spread some twitter love about our Water Ambassador as many times as you like. Or, pick one of the other options for a chance to win these great bottles. Have fun! This Giveaway will end Sunday, August 9th. Good Luck! Please note: Email is required to contact the winner – We will not share your email with anyone. « Eco-Office Gals: What Are You Reading? It sure is hot and humid this summer but after reading this post I think you’re right. WE can all get relaxing while tweeting this giveaway. I hope I can get it. .-= Gaga@Used Jet Skis´s last blog ..Hello world! =-. I registered with the Watercheck.biz site. Watercheck fact I learned and tweeted. I like the Evolve low flow showerhead. .-= blueviolet´s last blog ..The Best Gag Gift Idea EVER!!! =-. I follow SuperWaterMan! My name is soundofsilence7. I’m following SuperWaterMan on Twitter. Tweeted about a product I liked!! .-= Chrysa´s last blog ..$173 Pür Minerals Beautiful You Kit for only $75 – Today Only! =-. .-= Chrysa´s last blog ..Free Sample of Nutland Crunch =-. .-= Dddiva´s last blog ..FREE CHOCOLATE =-. .-= Name (required)´s last blog ..FrankKing12: A revivial? http://bit.ly/qeGZ7 =-. I signed up for coupons, newsletters, and deals. i follow Super Waterman on twitter – js22222222 . I am following on twitter.Username is lstanziani.Thanks! I tweeted about the giveaway – I’m new to Twitter though and I’m not quite sure how to direct you there, except that my Twitter name is luckymegs! Thanks for the awesome giveaway! I’m following on Twitter, my name is luckymegs!